In this example the function is called three times – once for each row – and as I said if you were calling a web service in this way, for example, it would be very inefficient. If you were calling a web service like this – perhaps by making a single POST request with all of these values in the body – it would be much more efficient. A function type whose parameters match the columns from the input table that we’re interested in using. 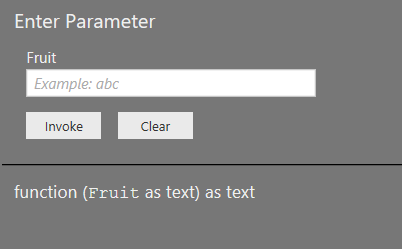 In this case the input table is the Product table and it has one text column called Fruit; we want to pass the contents of the Fruit column to this function. A function that is passed a table (in this case called InputTable) that has the same columns as those listed in the function type. The documentation says this function “must not enumerate its input table more than once” so it uses Table.Buffer() to make sure this is the case; it then takes the contents of the Fruit column from this table and passes it to the ListUpper function defined above, and returns a list of upper case text values. Basically, it creates a function that looks like it is being called on a row-by-row basis but which is actually called once for the whole table. This may seem obscure, but personally I think this is incredibly useful and important. Anyone writing a custom connector in the future (although Function.ScalarVector() isn’t available in the current release of the Power Query SDK I assume it will appear soon) is likely to want to use it, and remember also that custom connectors can be used to create M function libraries and I believe this scenario will be officially supported too. You can download the example pbix file for this post here. Have you tested whether this would have performance benefits locally vs regular function invocation? I think the point is that it does not have any inherent performance benefits, but it does allow you to implement your functions in a more efficient way than would otherwise be possible. Currently the function is getting invoked as many times as there are files in the Folder. You could rewrite your function using Function.ScalarVector but what do you want to achieve here? Unlike a web service there’s no way you can avoid opening Excel files individually. There might be some improvements possible if you’re getting data from multiple sheets in the same workbook though. We cannot convert a value of type Function to type Text. To be clear: the aim here is to speed up reading data from multiple sheets in the same Excel workbook, right? Are you sure Power BI is opening the same workbook multiple times in this scenario (I don’t know – I would have to test if you weren’t sure)? I’ve created a really primitive example at https://gist.github.com/CurtHagenlocher/498d68282f0d355fc55ef7ecb563805b which uses the Cognitive Services languages API to detect language. Even though it uses Table.AddColumn to detect language in a single row, it leverages the vectorization support to make only one API call per 1000 input rows. Note that I’m only buffering each page of 1000 values instead of buffering the entire column. This avoids having to enumerate the input table twice. Most of the magic in the implementation is there to let us stitch together multiple enumerations to avoid having to buffer too much. To take advantage of this streaming capability, you need to use something like List.Split to separate a list into a streaming-capable list of lists and then List.Combine to produce a single list from the output.